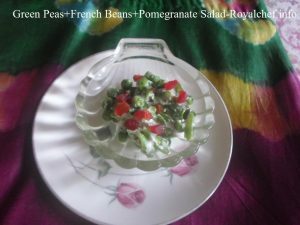 This is a Recipe for making at home Green Peas+French Beans+Pomegranate Salad. This salad made using the combination of Hirve Matar, Farasbi and Pomegranate Seeds is not only health and nutritious but also a great salad serving for any main course meal. Including party meals. Wash the French Beans and them cut into 1/2” pieces. 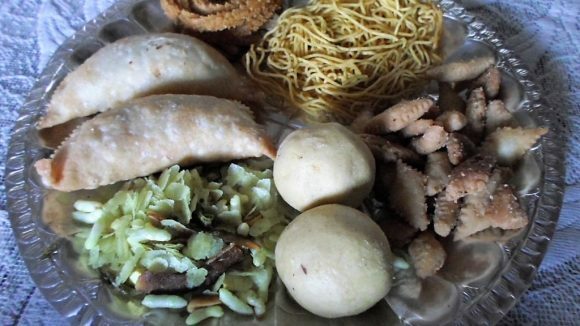 Drain the Water and keep the boiled Vegetables aside for cooling. Mix the boiled Vegetable, Pomegranate Seeds, Curd, crushed Black Pepper and Salt. Keep the Salad into the refrigerator for an hour. Then, serve the Salad chilled.